A few people have been asking when the river surfing season starts. I’ll focus on River Run Park, since that’s the wave people are frothing over, at least in Denver. 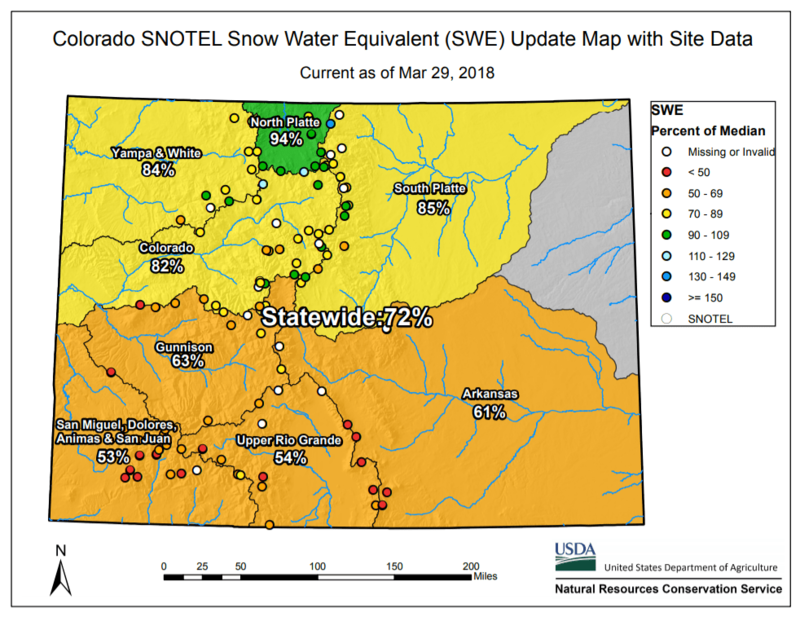 More like 2017 than 2016, with flows staying pretty low aside from the occasional rain/snow spike until the very end of April/beginning of May, but then they went nuts. 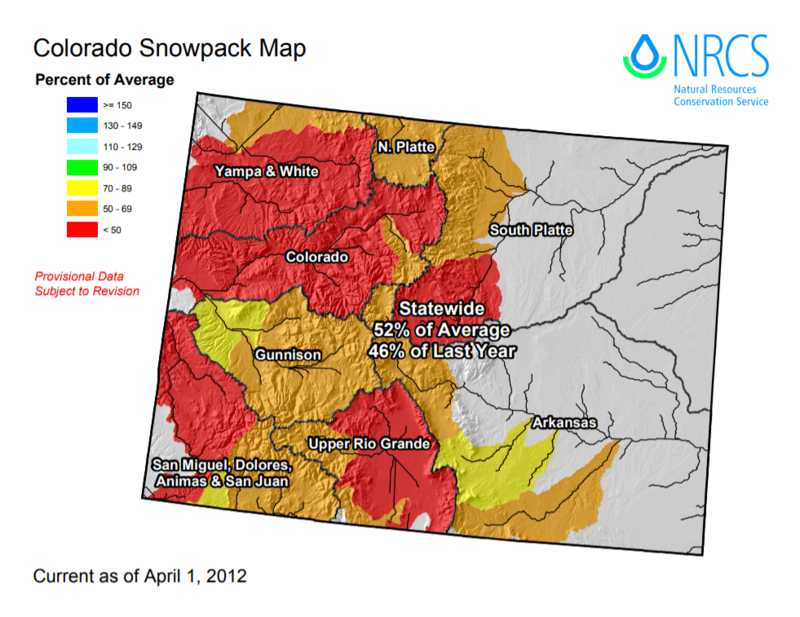 Seems out of character for the snow pack. 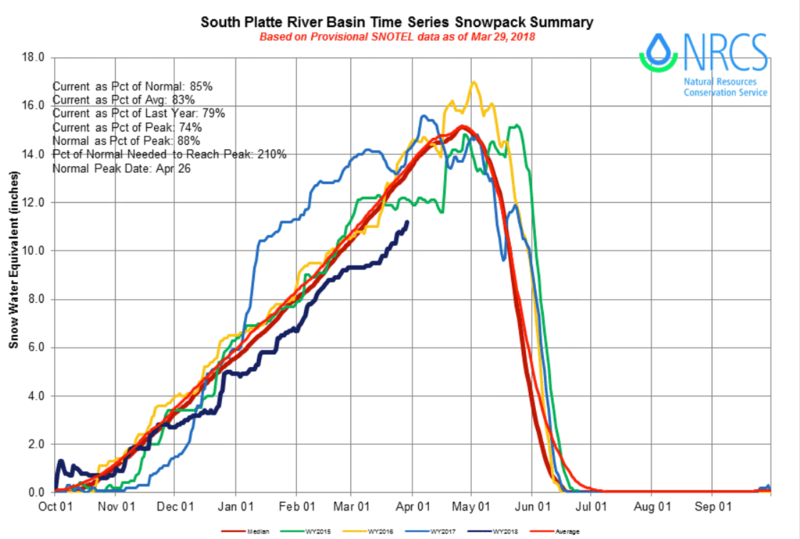 Another variation, it looks like 2014 saw a spike in flows for the second half of April, followed by things falling off and getting spotty in May, with steadier flows in the second half of May and into June. Overall, a pretty decent year. Unusual, compared to the others; the flows turned on but they didn’t do so until the second half of June. In most years, flows turn on (>200 cfs) at River Run sometime between late April and mid-May, but there are a lot of outliers. 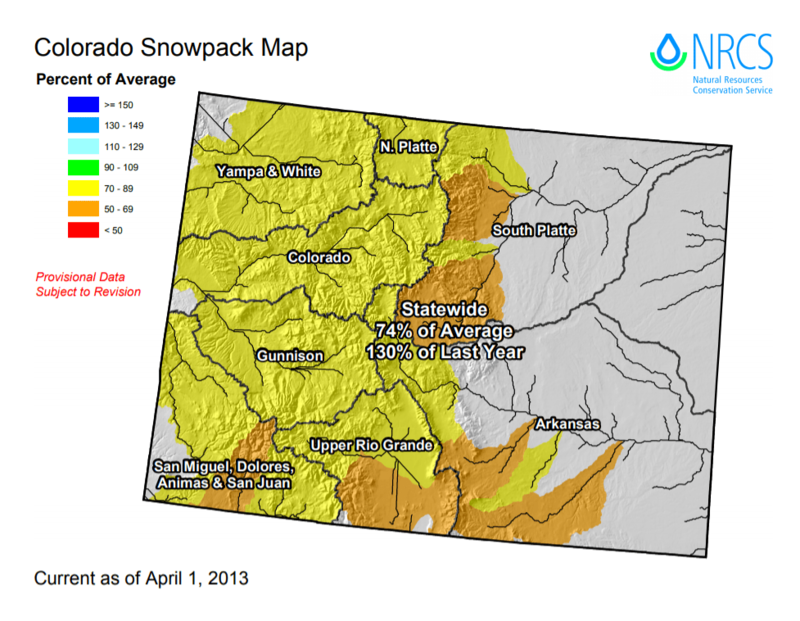 This year’s snowpack isn’t looking as dire as it did earlier in the year, but it’s still below average. 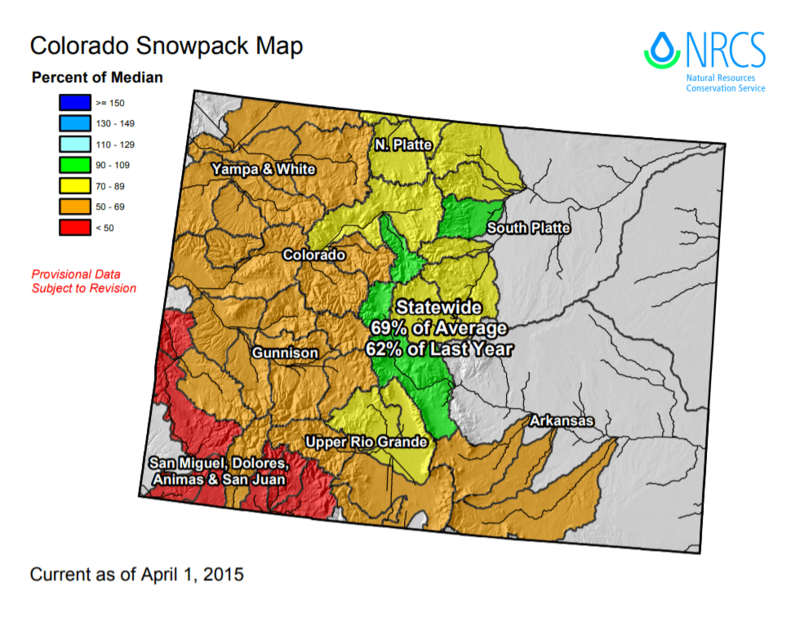 I have more information on the snowpack over here. 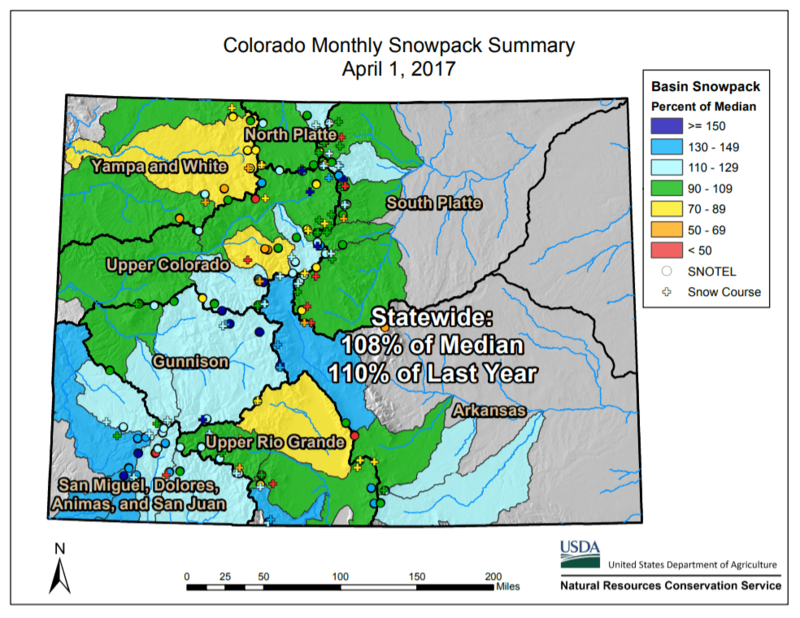 And I should be able to update that information in the coming months; early April tends to be our peak snowpack depth of the season. 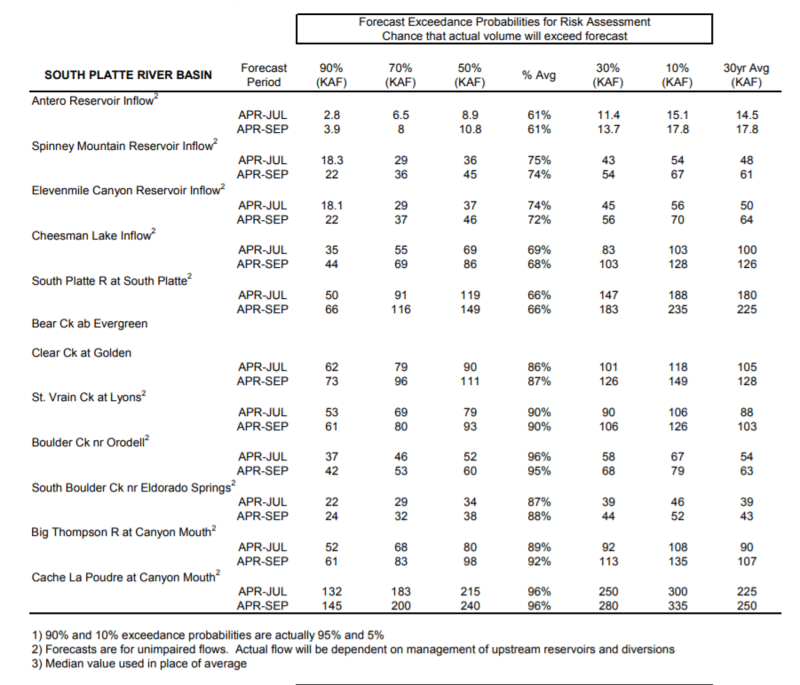 And this is how our reservoir storage is looking compared to average. Way better than I expected, frankly, though it’s tough to compare to earlier years since they didn’t make these pretty graphs before 2014. 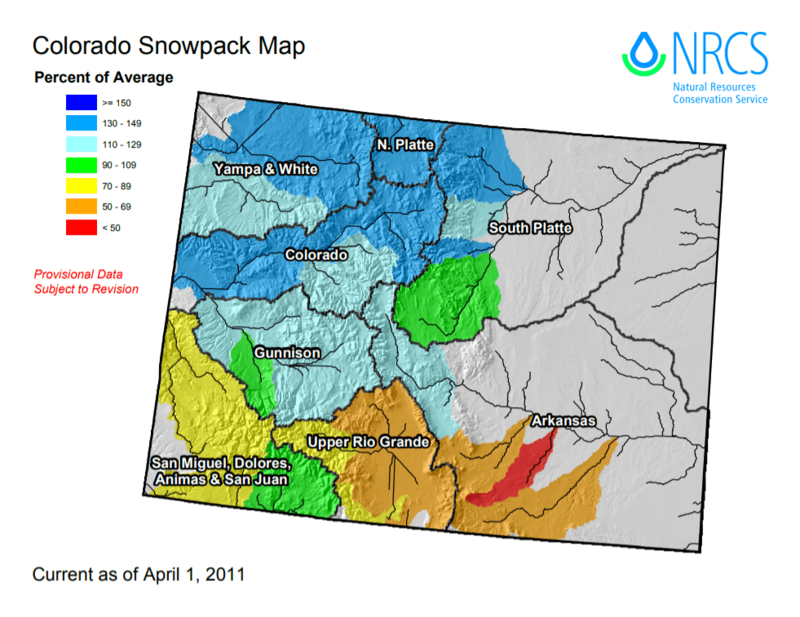 And Chatfield’s data is kept by NOAA, which isn’t as big on data analysis as the USGS. 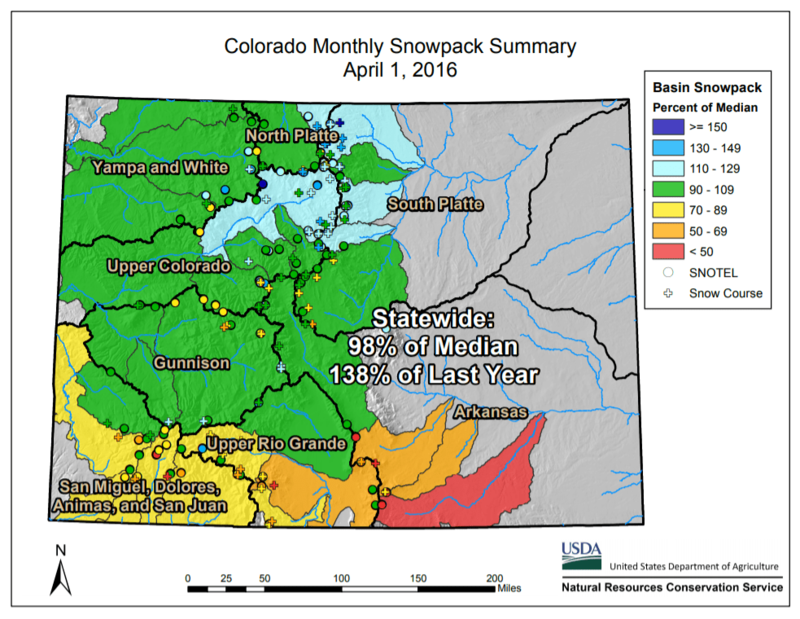 Current Chatfield storage is 24,531 acre feet. Low, compared to past historic years, but in line with last year. 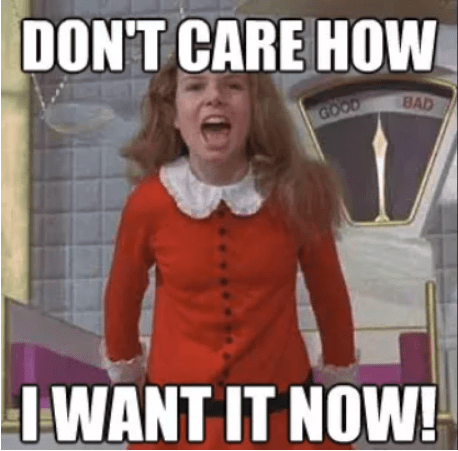 I think that has more to do with water level controls than anything else. 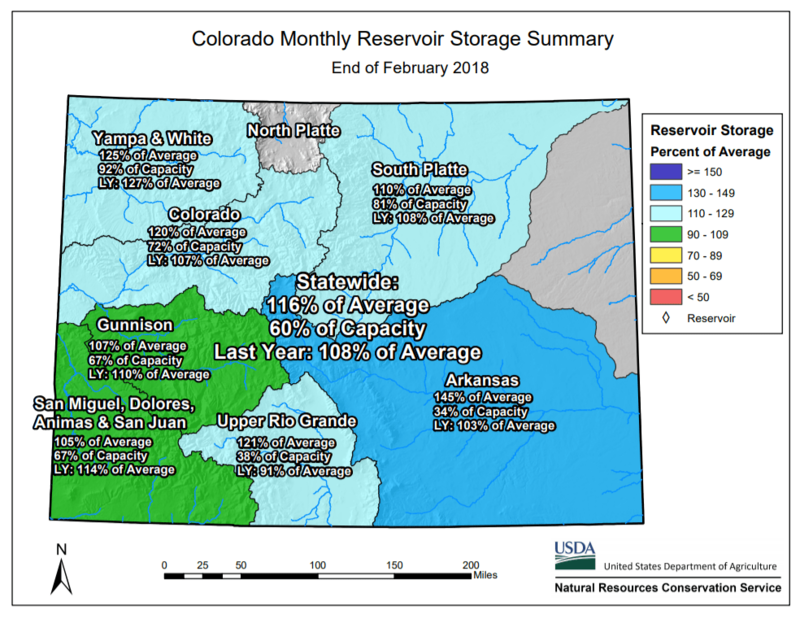 S. Platte Basin Reservoir Storage: 110% of Average as of 3/29/18. 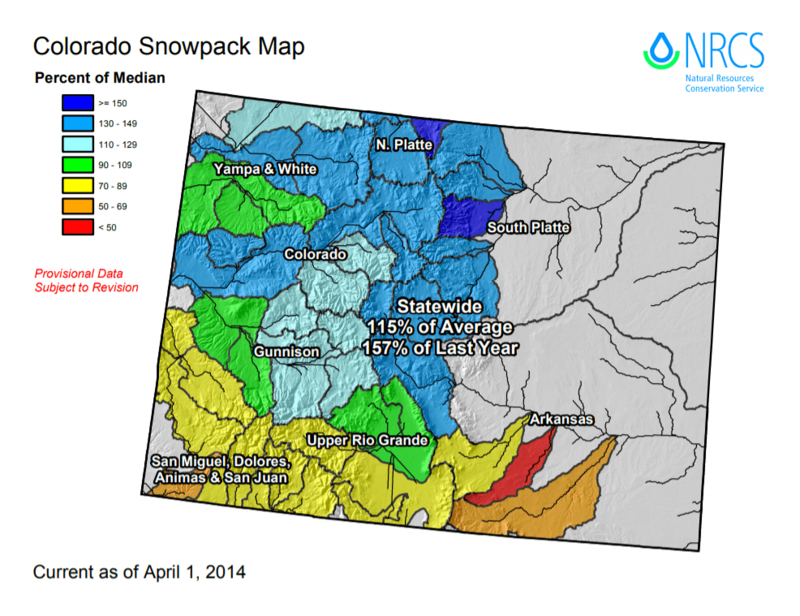 Overall, this doesn’t seem to have a particularly strong correlation with river flows if it’s near average. Finally, a word on water temperature and insulation. This time of year I tend to wear a Kokatat GMER drysuit, but I have it from kayaking and they’re expensive. Nice to have fuzzy socks at the end of a surf though. Note the big daily variations due to the shallow riverbed. Dawn patrol water temps are usually 10 degrees colder than they are at sunset. And we start to see a significant warm up in May or so, with water temps climbing into August. Finally, pay attention to the flows. 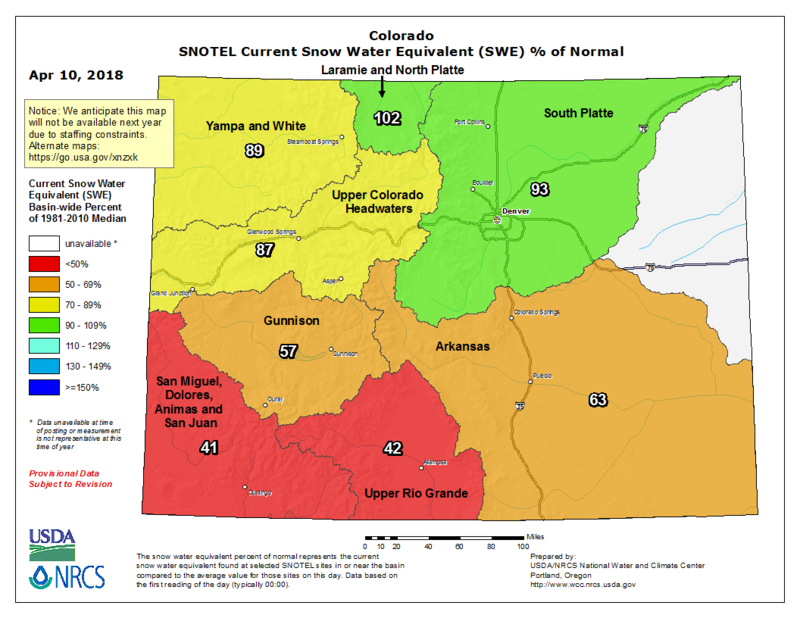 Though RRP may not run for a couple weeks or a month, there are other surfable waves on the front range that will turn on earlier with less water. And if you want notifications when the water finally does show up, I cover how to set those up here.